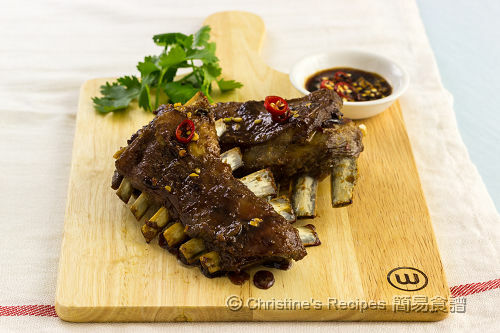 Lamb ribs, a kind of inexpensive cut, are very suitable for making slow-cooked or baked dishes. 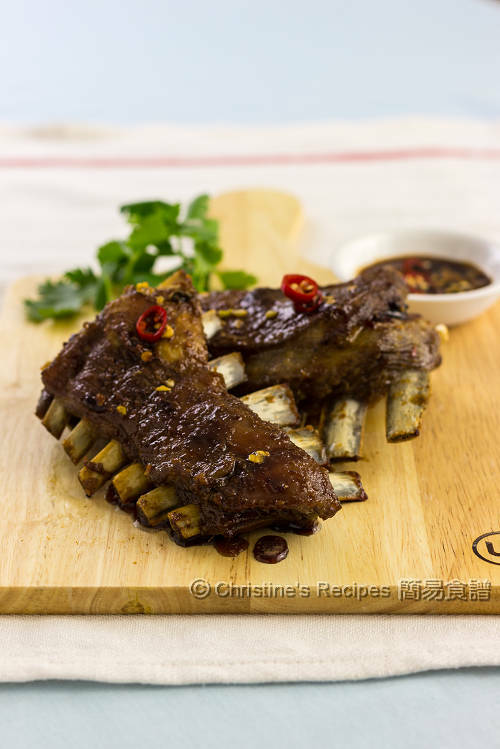 Here comes my family’s favourite baked lamb ribs with an Asian touch that we enjoy very much in cold days. Its taste is so rich that you don’t want to miss a drop in the dish. I’ve included the way that worked for me of how to keep these wonderful nibbles moist and tasty after long baking time. I found the lamb in Australia is fabulous. The meat is very tender and tasty. When some special occasions arise, I’ll think of cooking a dish with lamb. Different cuts of lamb cost differently of course. The prime one that most people love is lamb cutlet. You’ll find many fine-dining restaurants have their versions. So, if you want to try something different, give this dish a go. Rinse the lamb ribs and pat dry with kitchen papers. Mix with marinade well and put into a plastic bag or container with cover. Refrigerate for at least 3 hours, or over night for the best results. Remove the lamb ribs from the fridge and leave it at room temperature for about 20 minutes before cooking. Preheat oven to 160C / 320F, about 10 minutes. Transfer the lamb ribs with the marinade into a baking tray, with downside up. Cover with foil and bake in the preheated oven for about 45 minutes. Remove the foil. Flip the lamb rib to the other side up and continue to bake for 15 minutes, or until the surface turns brown. While baking, blast the ribs with the juice in the baking tray in order to keep the meat moist. Mix all the ingredients of sauce. Drizzle on top of the baked lamb ribs. Serve immediately. Lamb ribs are bargain cuts, available at supermarkets. If it’s not handy to you, you can replace it with lamb racks or cutlets, but adjust the baking time without covering with foil. 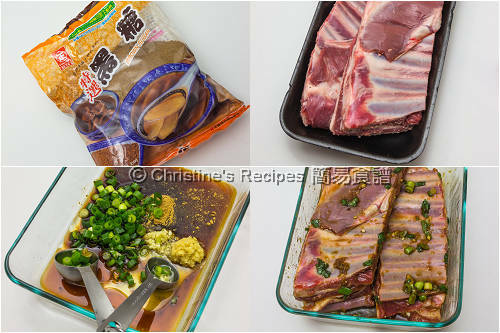 Tips on making moist baked ribs：To get the best results, use ceramic baking dish instead of metal tray. The ribs are moist and the juice in the dish won’t dry up too quickly. I tried using Pyrex glass baking dish and found the results were equally good. If using metal tray, it would be better if you add some water with the marinade for baking. Christine, these lamb ribs are finger licking good. I've never cook lamb ribs before; I shall bookmarked this for later. Thanks for sharing. Sure, you can use beef ribs and adjust the oven temperature. I don't have fish sauce, can it be replaced with something else? Thanks! Fish sauce tastes quite unique. Can't find anything to replace it. If you really like to try this dish and don't have any fish sauce at hand, simply omit it and add a bit salt or soy sauce, because fish sauce has a savoury flavour. If we use pork ribs or beef short ribs instead, what temperature would you suggest for each and what's the length of cooking time would you recommend for each? The temperature can be the same. The baking time depends on how thick the meat is. Normally, pork ribs are thicker, they need longer cooking time. Try to add 10 minutes as an increasement on top of the recipe yielded and take it out to test the meat. I just made this recipe with kid ribs (as in young goat), but increased the chilli, and added to the marinade some szechuan pepper and half a stick of cinnamon ground up, and the grated zest as well as the juice from the lemon. I skipped the sauce, and served it up with a cucumber, mint and chilli salad. Also increased the temperature and decreased the cooking time. It came out very juicy and went down extremely well. Thanks.